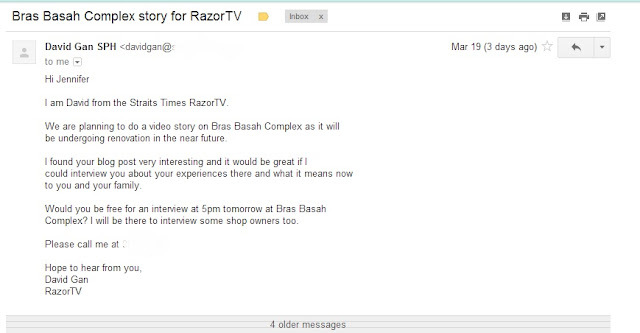 Few days ago, I was filled with excitement when I read an email from David Gan of RazorTV. He was referring to my blog post Loving My Spot (in Singapore) - Bras Basah Complex that I wrote to participate a blogtrain initiated by The Playful Parents. 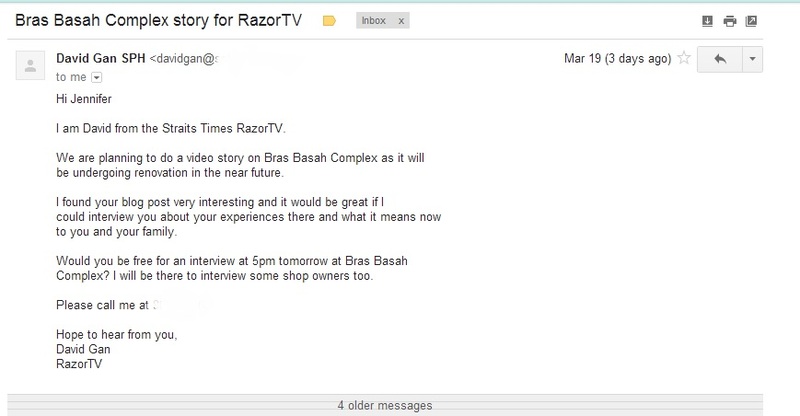 I was not sure whether to go for the interview or not as I was not exactly a "public" person. I have to make a fast decision as the interview was later that same day! In the end I decided to go ahead because Bras Basah Complex holds a special place for me and the family. So, here is the video interview. 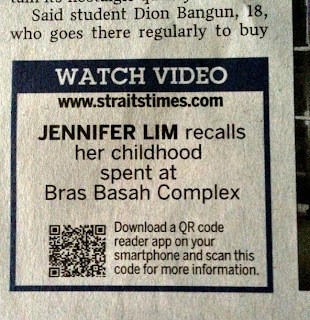 Regina snapped this and send it to me as soon as she saw it in the Straits Times. You can read about the full article in today's Straits Times, MAKEOVER OF BRAS BASAH COMPLEX - New look, same great contents. If you are a subscriber to Straits Times online, click here to go to the article. This is how the new Bras Basah Complex will look like after its facelift. Do you like it? It looks refreshing and funky. I'll most likely have a date with my Canon EOS at this special place again after the makeover. Thank you David & Sue Ann (the sweet Journalist who was interviewing me) for this wonderful memorable video interview. For some reason, I prefer old things to stay... Places are like food, seize the sentiment, lock the memories. Well, it is just me;). Angeline, did u jostle with the crowd to listen to his songs? Great job with the interview Jen. So sad to see the the original bras basah go :( it also holds special memories for me and my family. With every building refurbished, memories are lost. But oh well, change is the only constant isn't it. Thanks Zee! Ya the old stuffs always gives way to new things but luckily they are only giving it a facelift and not demolishing it. hello, famous celebrity! i'm jostling with the crowds for your autograph!!!!! Hi Dino Mama....usad that it is going to be just like the other malls out there. Wow, great interview...and glad to connect with a fellow Singaporean blogger! !